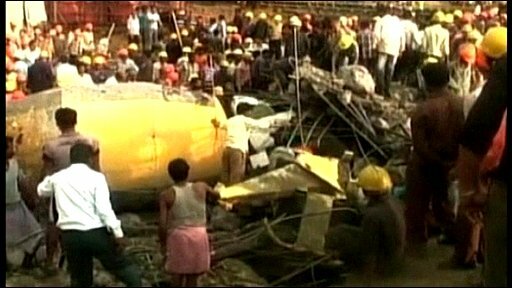 At least 22 workers have been killed and scores are feared trapped after a building collapsed in the Indian state of Chhattisgarh, officials say. Officials say that a chimney caved in on more than 100 workers during construction work at a thermal power plant. The accident happened in the town of Korba, 250km (155 miles) from the state capital, Raipur. The plant is being built by Bharat Aluminium Co Ltd (Balco). Balco is a unit of London Stock Exchange-listed Vedanta Plc, whose business activities are mostly in India. "It's a massive accident," Ratanlal Dangi, district superintendent of police, told Reuters news agency. "We have retrieved 20 bodies so far. Still many more are trapped under the collapsed chimney's debris. Massive rescue and relief operations are under way." Rescue workers are expected to work through the night to try and reach those still trapped underneath the rubble. They are being helped by other construction workers as well as local residents. The families of many missing workers have gathered at the site waiting anxiously for word of their relatives. It is still not clear what caused the accident. All the reports say the area has been experiencing heavy rain and storms. Chhattisgarh Chief Minister Raman Singh said a judicial investigation had been ordered into the accident. State officials said the management of the company building the plant are likely to face charges. A recent report by the UN's International Labour Organisation said that nearly 50,000 Indians die from work-related accidents or illness every year.